Leading Exporter of amoebic top buffalo mats and checked top buffalo mat from Kottayam. 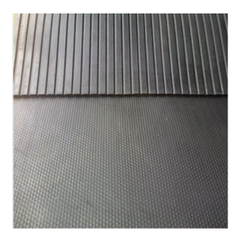 TJP Amoebic Top Buffalo Mats are developed specially for flooring; it is non-slip, heavyweight and hard wearing. It reduces cleaning time, lowers dust levels and improves hygiene in stables as well as giving you a cost-effective solution teamed with superior quality. TJP Buffalo mats provides optimal comfort for your herd. It also offers the best quality/price ratio on the market due to the unique design, product research and development and manufacturing techniques utilized at TJP. Backed ourselves with competent employees, we are readily immersed in presenting to our customers a wide spectrum of Checked Top Buffalo Mat. These buffalo mats protect the vehicle from grit and dirt of everyday and allows smooth and supreme functioning of the vehicle. Non-slip surface provide firm grip during lying down and standing up decrease slippage & falls and reduces animal stress and serious injuries. At the end, these mats are offered for sale at nominal rates in the market. Looking for Rubber Buffalo Mats ?